Greetings! Quick tutorial which may come in handy for future new members. If you are a future new member, hello! First, to install any of these, your computer will need either WinRAR or 7zip installed. Both are free and completely virus-free. My example pictures will show screenshots of 7zip, but WinRAR is similar. They extract files from compressed formats such as .7z and .rar, but can also do the .zip's your PC will already be able to do. First step is a small amount of research, and this itself comes in several steps. i. Check if the mod you want to install is available as part of a full, ready-to-go file in the Working Game section of the Downloads. If it is, stop reading this guide and go here. This guide will teach you the steps to installing any mod found in the Working Game section. ii. If it isn't there, find it in the AI Packs and Patches section. 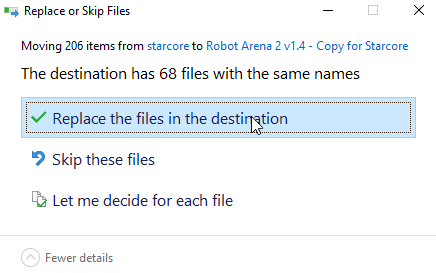 In the description for each pack, you should be able to find out what version of the game you need to install the pack over - for example, Starcore is installed over Stock and Robot Wars 2005 AI is installed over DSL 2.1 or 2.2. Download the AI Pack or patch. As you need to install the pack over the game, you need to have the game ready to be installed over. Make sense? Good. You can either copy and paste a version of the game if you already have a copy of what you need, or download and install a copy of the version you need using this guide. At the end of this, you should have a full copy of whatever version of RA2 you need installed and ready to be upgraded. Now, the AI Pack you downloaded at the start must be extracted from using 7zip or WinRAR. This image uses 7zip and Starcore v3 AI but the process is near identical for WinRAR and any other AI pack. Extract the file to any destination - I highly recommend an empty folder prepped just for this! Now open the folder. When you get to a folder containing a folder (among others) called AI, drag and drop all these files into the copy of RA2 you prepared earlier. When you're asked whether to overwrite or not, click overwrite. And there you have it! The pack should now be installed!